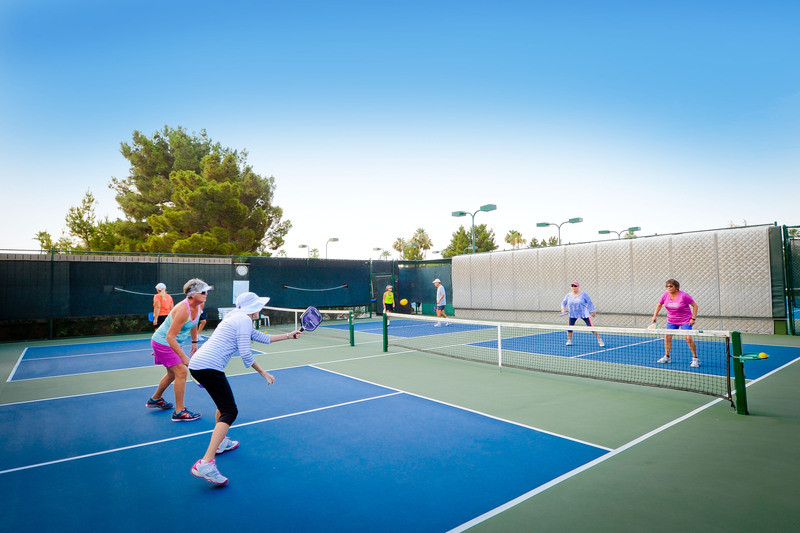 Don’t let the name fool you, pickleball in Sun Lakes is one of the fastest growing sports. Not only here but all across America! That fact is apparent when you find out that there are multiple pickleball courts throughout all five of the communities. 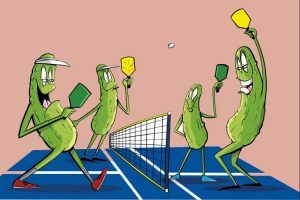 It may be a fast-growing sport but not everyone is familiar with pickleball and the rules of the game. I’m definitely no athlete but this looks like a sport even I could play! Are you ready to learn? Would it surprise you to learn that this sport has been around since 1965? Surprised me. Three dads in Washington state were looking for something to entertain their kids one summer evening and pickleball was born. They weren’t able to find one whole game so instead used pieces of different games. These dads then created rules of the game that had one main goal in their mind, for everyone to have fun. So why the name pickleball? You can find more than one answer to that question. One claim is the sport was named after a family dog, Pickle. The other claim is that one of the moms said the hodgepodge of sports reminded her of pickle boat. A crew of oarsman that were “leftover” from other boats. Another theory is that it’s both combined. Whichever is correct, in 1967, the name became official. What do you get if you cross tennis with badminton and table tennis? 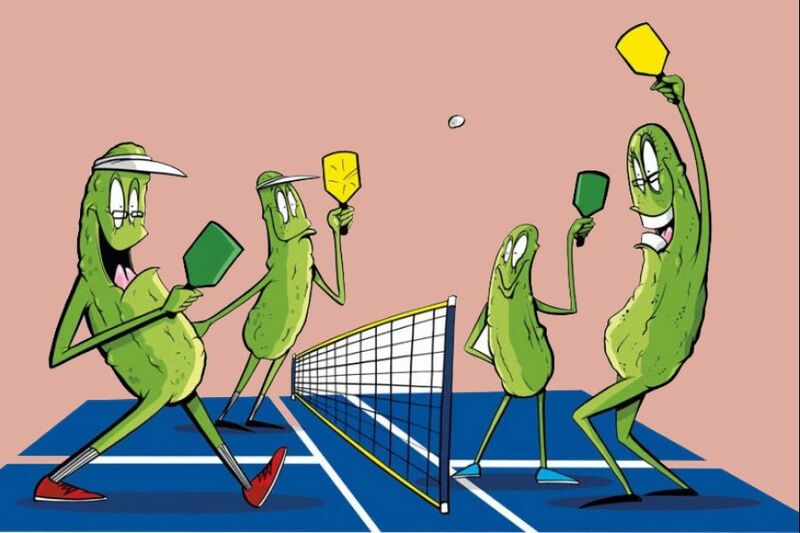 That’s right – pickleball! A hybrid of all of these sports but there are a few key differences. This game is played on a court that is about half the size of a tennis court and close to the same size as a badminton court. Although the net is shorter than a net in tennis, it stretches across the court like a tennis net. Same as table tennis, pickleball is played with a paddle, not a racquet. You will see that the game is a mixture of all sports but rules do rely heavily on badminton. The first thing you need to decide is if you’re playing one on one or teams of two. You will use a paddle that looks like a smaller racquet. More on that later. The ball is volleyed back and forth with rules that mirror a lot of the rules of tennis with some modifications. One of the reasons this is such a growing sport is that pickleball knows no age limit or gender restrictions. 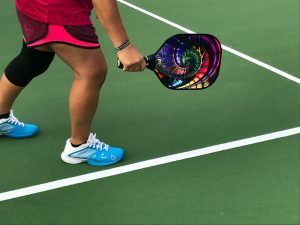 If you are a beginner it’s easy to learn, yet pickleball can also be a competitive sport for those that are more experienced. When you score a point, you switch service to the other side of the court and serve again. You will continue service until you or your partner commits a fault, then your opponents take up service. You win the game once you have 11 points and you must win by 2. All paddles are not created equal when it comes to pickleball. Paddles range from six to fourteen ounces in weight. Usually, you would start with a paddle weighing between 7.3-8.4 ounces. If you choose a heavier the paddle, your shots will have more power but can also put a strain on your wrist or elbow. Now that you’ve found the right weight, what’s next? Grips of the paddle, of course. A standard grip ranges between four and four and a half inches. A general rule of thumb is your grip size should be congruent with the size of your hand. Last but not least, you need to decide on the shape of the paddle. I would recommend you being mindful of the regulations for approved paddles if you are considering any tournaments. You won’t have a problem finding a court to play pickleball in Sun Lakes for fun, but you can also look at joining a club. Sun Lakes Pickleball Club Cottonwood, visit their website here to find out more information about what they offer. Ironoaks has a group of individuals with the Sun Lakes Pickleball Club and you can find out more about them here. IronOaks is also expanding with new courts and parking. Whether you are looking to play often or just now and then, you will be able to find your court in this community. For more information on what Sun Lakes communities have to offer you, contact us here or call at 480-440-0849. Visit us here on our Facebook page for an informational video of pickleball!